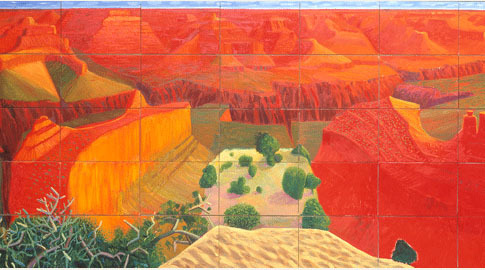 David Hockney's A Bigger Grand Canyon is a series of 60 paintings of the Grand Canyon in the Arizona desert, that are combined to produce one enormous picture that gestures back to Picasso. It was bought by the National Gallery of Australia. The radiating color and perspective of this composition draws me in. It makes me aware of my "outsider" status as viewer.The schism between observer/participant feels as great as the height of the cliffs. I have never seen the Grand Canyon; perhaps some day. This relates well to his photo-collages. I'm not a huge fan of Hockney's landscapes, but the scale of this one is pretty impressive. This still doesn't do the real Grand Canyon any justice - its scale is unbelievable. I took tons of panorama photos when I was there but it doesn't translate. I'm probably going back there this summer - this time to the north rim. We have traveled the perimeters of this color together, haven't we, dear Moon? What I want to say about this image is hard for me to get across. I think that when painting a landscape of this size Hockney used the 60 canvases to try to get a sense of how large the place is. And I dont mean that he wanted to the painting to be bigger. I mean like he wanted to capture the Grand Canyons enormity and all the different parts of it.